Obituary for Frank M. Johnson Jr. | Gaskill Brown Funeral Home & Cremation Services, LLC. Frank M. Johnson Jr. of Cinnaminson passed away suddenly on Monday, January 14, 2019. He was 57. Born September 21, 1961, he was a 1980 Graduate of Willingboro High School. Frank was a driver for UPS Freight in Pennsauken and dedicated member of Teamsters Local 676 for over 25 years. 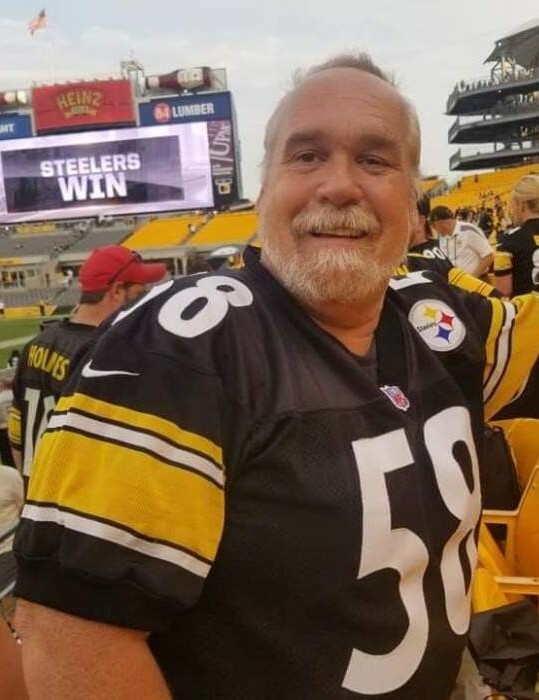 The only thing he loved more than his family and friends were his beloved Pittsburgh Steelers. Frank was an avid concert goer. He loved all music but his favorites were Pink Floyd, The Rolling Stones, and Black Sabbath. He had seen Ozzy over 40 times. Frank loved Fleetwood Mac, especially his girl Stevie Nicks! He loved spending time with his friends and family and was always the life of the party. His door was always open and everyone was always welcome. He was a very proud Grandpop and would tell everyone about his Grandson, Gunnar and had to show every picture he had. Frank said that Gunnar was his Steelers buddy. Son of the late Frank Sr. and Dorothy Johnson, he is survived by his son, Frank M. Johnson III and his wife Katie; his loving fiancé, Amy Brady and her daughters Alexis, Courtney; and their daughter, Payten; a grandson, Gunnar Stephen Johnson; two grandchildren, Brayden, Layla; a sister, Dottie Cooper; a nephew, Christopher Huhn; two great-nephews, Matthew, Anthony; and numerous friends. Relatives and friends are invited to his visitation Friday, January 18th from 11 to 12 pm at the Gaskill-Brown Funeral Home, 33 West Maple Avenue, Merchantville. Funeral service will follow at 12 pm. In lieu of flowers, memorial contributions may be made to the Cinnaminson Fire Dept., 1621 Riverton Rd., Cinnaminson, NJ 08077 or a charity of the donor’s choice.